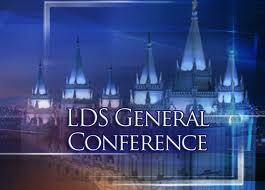 Today was the first day of General Conference for the Church of Jesus Christ of Latter-day Saints (i.e. Mormons). For those not familiar with it, I’ll briefly describe it in my own words. Based on a revelation given to Joseph Smith, found in the Doctrine and Covenants Section 20, verses 61-62, the church is to come together for inspiration and conducting business, which includes sustaining the elders of the church. The revelation suggests every 3 months, but we come together every 6 months now. During the conference, all of the highest leaders of the Mormon church speak including all of the 12 apostles, the First Presidency, Many women leaders, and also members of the Quorum of the Seventy. Each of the people who speaks spends time praying and preparing for what the general membership of the church needs to hear along with people not of the Mormon faith who may be listening in. It is interesting to learn from the perspectives of the leaders at the highest level, who dedicate everything to traveling around the world to help humanity. Today one of the members of the Quorum of the 12 Apostles, Robert D Hales, encouraged all of us to reflect and re-read or listen to what was said during this weekends’ Conference. He said that we would receive personal revelation from the Lord in doing so. As he spoke, I reflected on an experience I had just a few months ago. In last Aprils’ General Conference, one of the members of the Quorum of the 12 Apostles, Richard G Scott, spoke about the power of reading scriptures as a family. We had tried numerous times over the years to have family scripture study. Over the course of just a couple of days we would get out of the habit and back into our normal schedule. We would then completely forget about it until the next General Conference, when someone would say something about scripture study as a family again and the cycle would continue. As I read Elder Scott’s talk, this time was different. When I re-read his talk a couple of months after he gave the talk, it was as if I was hearing it for the first time. Things jumped off the page at me and I received a simple, but inspired idea to help my family. A simple, but very profound idea came clearly into my mind. I knew it was from the Lord because of how clearly and powerfully it entered into my mind. It was simply this: put a copy of the scriptures out on the kitchen table as a reminder to read. After saying a blessing on the food, read a few verses out of the scriptures and have a small discussion with the kids. We started doing it and the results have been great! It’s been about 4 months now and we are to the point that if we don’t read scriptures, our 4 year old daughter will remind us to. It has become a habit and part of our routine. I’m very grateful that God speaks to us individually and through His servants. It has blessed the lives of my family. I encourage everyone to listen to General Conference tomorrow and then spend time in the ensuing months to re-read or listen to the messages. I’m confident you will receive personal revelation.